Game Information: Ancient Egypt has always been a popular theme for online pokies and thanks to Microgaming, we have another game taking you back in time. 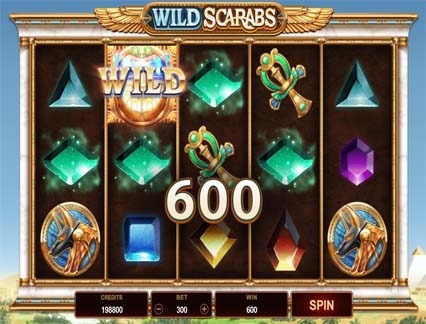 Wild Scarabs is a thrilling online pokie that will have you spinning your way to great wins in no time. Since it is powered by Microgaming, players can expect a fun-filled and high-quality gaming experience directly from the comfort of your home or while on the move. In addition to a base game mini-feature you will also have access to some lucrative free spins for your pleasure. Wild Scarabs is a 5 reel 3 row pokie with 243 ways to win. There is no payline structure. Combs can be made when matching symbols appear in adjacent rows starting from the left-hand side of the reel. Marble columns frame the reels and float above the landscape, adding to the effect of your experience. Playing Wild Scarabs is easy and perfect for beginners and more experienced players alike. The game is based on scarabs, which dart across the desert sky with the aim to unleash its power on ancient Egypt. In terms of visuals, the game is striking, set against the mysterious Egyptian skies, creating an enchanting setting. The high-value symbols are represented by common Egyptian-themed symbols, including two gods, the Eye of Ra and an Ankh. The lower-valued symbols are six sparkling gems in various colours, including blue, orange, yellow, purple and dark blue. Because there are 243 ways to win, the game does not feature any paylines. With a wide pay range, players can start your betting from as low as 0.20 or up to 20 coins per spin. You can also win multiples of the coin value when you see the same symbols line up on the reels. The six different colourful jewels represent the lower-valued symbols while the themed-symbols are the most lucrative. The standard Horus, one of the gods, is worth 40, 125 or 300 coins when it lands on the third, fourth or fifth reels on the right side of the game respectively. The gold and blue coloured scarab is the wild symbol that awards 50, 250 or 500 coins when it is lined up on the payline without replacing other symbols on the reels. The scarab is the wild symbol and replaces all other symbols on the reels to create winning combinations, except the head scatter symbol. There are some exciting and lucrative features within the game, including a Wild Deal and Free Spins. The Wild Deal can occur on any non-winning spin where the wild lands on the third reel. Here, up to four extra wilds will now be placed on the reels to form a guaranteed win. The free spins feature is triggered when you land three or more scatter symbols anywhere on the reels. If this is triggered, you will receive a cool 10 free spins. Here, any wild symbol which do not contribute a win are collected. When you have three, they will be added back onto the reels for the chance to earn a guaranteed win. That said, it is not possible to trigger any more spins from within this feature. The graphics and sound effects are stellar, which is expected from a title from Microgaming, one of the leading software providers in the world. 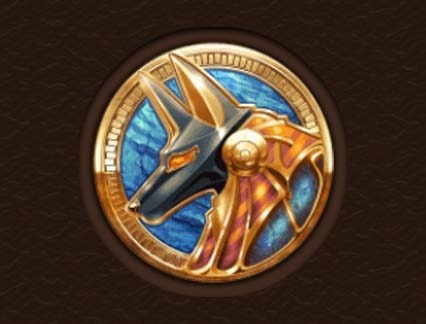 That said, players can expect some stunning details when it comes to the symbols featured in the game, most notably the gods Anubis and Horus and the Ankh icon. The reels look stylish surrounded by a marble frame topped with gilded wings. Behind the structure you will see white pyramids with gold peaks shimmering in the desert sun while the background music is crisp and compliments the theme perfectly. 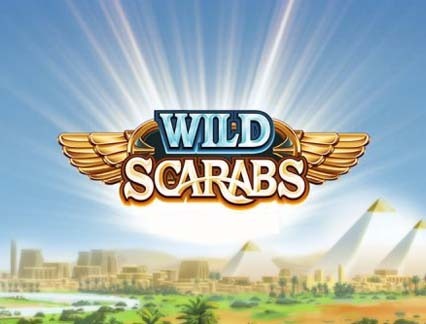 Wild Scarab is not a progressive jackpot game, so there is no major cash prize up for grabs. That said, there are plenty of opportunities to win thanks to a lucrative free spin feature that boosts your bankroll and a wild symbol that improves your chances of winning. As mentioned above, Wild Scarab boasts two lucrative bonus features that boost your opportunities to win big. The first is the Wild Deal and the second is the popular Free Spins feature that awards 10 free spins just for triggering the feature. This really adds some fun and excitement to your gaming experience in addition to improving your chances of winning some decent rewards. In addition, the game is available to play across all devices, allowing you to take your gaming on the go.